I could hardly be more excited. This spring, Professor Lee Hardy of Calvin College (my alma mater) will take us on a fascinating ride through the streets of Amsterdam and Copenhagen, two of the world’s leading cities for bicycling. Professor Hardy’s inspiring multimedia presentation demonstrates how these cities make way for people on bikes and help them get around in a way that’s fun, easy, and affordable – for everyone! After he answers your questions, we’ll turn our attention to our own community here in Holland, Michigan. Elisa Hoekwater, author of the greater Holland region’s new non-motorized plan, will offer a brief update on where things stand around here. Your input is welcome! Delicious cookies and coffee from Simpatico Coffee will be available for you to enjoy. The event will be held in Fourteenth Street Christian Reformed Church’s brand-spanking-new fellowship room. It’s cozy in the best kind of way, and you’re going to love it. 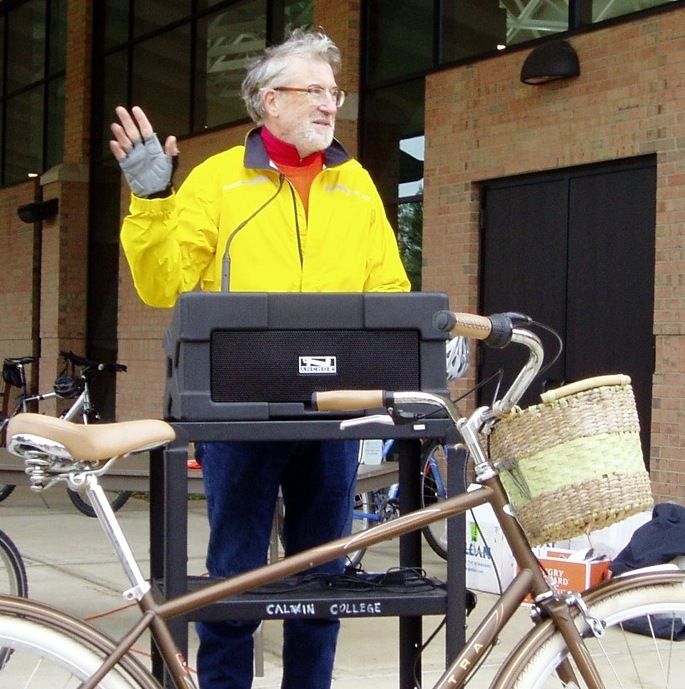 Join us on Saturday, May 10 at 7:00 p.m. to celebrate Bikes in Holland! Tickets are $10 and are available online now! Few things are ever accomplished by one person working alone. E-mail a friend today. Take just a second right now to copy this link – http://wp.me/p2MikN-BQ – and send it to a friend. It will bring them to this page, so they can read about this great event for themselves. Join the Event Team. There’s still plenty to do, from publicity to event set-up to considering ways to help these ideas gain traction in our community. Put us in contact with potential sponsors. I would still like to have a few more sponsors to help underwrite this event. Our primary sponsorship levels range from $50 to $250, and we also have a low-cost ticket sponsorship option. Contact me at tulip.lane@outlook.com with any questions or for more information. This is going to be so much fun – I hope to see you there!